Dr A Papadopoulou, First Department of Paediatrics, ‘P & A Kyriakou’ Children’s Hospital, Thivon & Levadias, Athens 115 27, Greece. Nutritional insult after bone marrow transplantation (BMT) is complex and its nutritional management challenging. Enteral nutrition is cheaper and easier to provide than parenteral nutrition, but its tolerance and effectiveness in reversing nutritional depletion after BMT is poorly defined. Nutritional status, wellbeing, and nutritional biochemistry were prospectively assessed in 21 children (mean age 7.5 years; 14 boys) who received nasogastric feeding after BMT (mean duration 17 days) and in eight children (mean age 8 years, four boys) who refused enteral nutrition and who received dietetic advice only. Enteral nutrition was stopped prematurely in eight patients. Greater changes in weight and mid upper arm circumference were observed in the enteral nutrition group, while positive correlations were found between the duration of feeds and increase in weight and in mid upper arm circumference. Vomiting and diarrhoea had a similar incidence in the two groups, while fever and positive blood cultures occurred more frequently in the dietetic advice group. Diarrhoea occurring during enteral nutrition was not associated with fat malabsorption, while carbohydrate malabsorption was associated with rotavirus infection only. Enteral feeding did not, however, affect bone marrow recovery, hospital stay, general wellbeing, or serum albumin concentrations. Hypomagnesaemia, hypophosphataemia, zinc and selenium deficiency were common in both groups. In conclusion, enteral nutrition, when tolerated, is effective in limiting nutritional insult after BMT. With existing regimens nutritional biochemistry should be closely monitored in order to provide supplements when required. Bone marrow transplantation (BMT) has been shown to have a profound effect on nutritional status and nutritional biochemistry in children. Nutrient intake is impaired by nausea, vomiting, dysgeusia, anorexia, and multiple organ dysfunction.1 BMT in children is associated with diarrhoea and protein losing enteropathy,2 3 hypoalbuminaemia,3 4 and trace element deficiency.5 Malnutrition has been shown to be associated with poorer outcomes in many types of malignancy, although the causal nature of this relationship is unproved.6 7 In children with leukaemia, malnutrition is associated with a higher infection rate,8 while zinc depletion after BMT is associated with more frequent episodes of fever of longer duration.5 There is therefore a pressing need to prevent malnutrition, by providing appropriate nutritional support to this group of patients. Although parenteral nutrition has been considered to be the method of choice for providing nutritional support to these patients,9 10 it is recognised that enteral nutrition has a beneficial effect on gut mucosal barrier function in experimental animals11 and in humans,12 and is also cheaper13 and easier to provide than parenteral nutrition. Its tolerance and efficacy in children undergoing BMT is, however, still disputed. Some investigators consider that ‘forced enteral feeding’ is an unacceptable option for nutritional support in young children with cancer,14 while others have shown enteral nutrition to be well tolerated by children undergoing treatment for malignancies.15 Studies in adults undergoing BMT have also shown supplementary enteral nutrition to be feasible.13 16 A recent anecdotal report in a child undergoing BMT claimed good tolerance of long term enteral feeding after BMT.17 We were not aware, however, of any prospective studies assessing the tolerance and efficacy of enteral nutrition in children undergoing BMT. The aim of the study was therefore to assess prospectively the tolerance of enteral nutrition by children undergoing BMT, and its efficacy in preventing nutritional insult caused by BMT. Enteral nutrition was offered to 29 patients undergoing BMT. Twenty one patients (mean age 7.5 years; 14 boys) elected to receive enteral nutritional support while in hospital for BMT, and eight children (mean age 8 years, four boys) refused. Outcomes in these two groups were compared. Table 1 shows the characteristics of the patients. The study was approved by the ethical committee of South Birmingham Health Authority. Informed consent for taking part in the study was obtained from patients or, where appropriate, their parents. Episodes of vomiting (more than twice a day for more than two days), diarrhoea (more than three loose stools per day for more than two days), and fever (>38°C per day for more than one day) were recorded. Total white cell, lymphocyte, and platelet counts were checked daily. Serial serum biochemical analyses (urea, creatinine, albumin, electrolytes, liver function tests) were carried out twice a week (by reflectance photometry on a Kodak Ektachem 700XR). Serum calcium, phosphate, magnesium, and plasma zinc, selenium, and copper were carried out once every week (minerals by reflectance photometry on a Kodak Ektachem 700XR; trace elements by atomic absorption). Diarrhoea during enteral nutrition was investigated in three patients (stool reducing substances, chromatography, and steatocrit19). The indications for enteral nutrition were weight loss of more than 5% of the admission weight or a greater than 10% decrease in mid upper arm circumference, or both. The sole exclusion criterion was the presence of oral mucositis at the start of nutritional support. Twenty one children gave their permission to start supplementary enteral nutrition, while eight patients were upset by the idea of having a nasogastric tube and elected instead to follow dietary counselling. Enteral nutrition was provided through a nasogastric tube via a Kangaroo 330 pump (Sherwood Medical Industries Ltd). Nutrison Paediatric (Nutricia), which provided 0.00418 MJ/ml (1 kcal/ml), was given to children weighing up to 20 kg, while Fortisip (Nutricia), which provided 0.00627 MJ/ml (1.5 kcal/ml), was given to children weighing >20 kg. One patient who developed diarrhoea for more than three days, and another one who received enteral nutrition after 43 days of parenteral nutrition due to gut graft versus host disease were given Pepdite 2+ (SHS). The volume of the feed was individual to each patient. The total daily intake was planned to provide 100% of estimated average requirements for energy, based on admission weight, which was appropriate for a physical activity level of 1.4.21 Overnight nasogastric feeding was scheduled to provide half of the daily requirement within seven days of starting. Feeding was introduced at a rate of 10 ml per hour, increasing by 10 ml per hour per day if tolerated. When the total scheduled volume was achieved, the infusion rate was increased in order to provide the same volume during 10 to 14 hours overnight. Oral intake was encouraged during the day. Overnight feeds were stopped when patients achieved 100% of estimated average requirements for energy by the oral route. The amounts of trace elements and minerals provided in 100 ml of Nutrison Paediatric (Fortisip) were as follows: zinc 0.6 (1.5) mg; copper 87 (230) μg; selenium 2.33 (6.4) μg; and magnesium 20 (30) mg.
Dietary counselling was provided several times a week until the discharge by an experienced paediatric dietitian in order to promote a high energy oral intake. Oral energy supplements (Maxijul, Calogen; SHS) were added to the drinks, and sip feeds encouraged. Differences in the nutritional status before compared with after enteral nutrition/dietetic counselling as well as differences in serum minerals before compared with during enteral nutrition/dietetic counselling were analysed using paired Student’s t test. Differences in the z scores of the anthropometry indices between the study group and the controls were analysed using non-pairedt test. Mann-Whitney test was used to analyse differences in plasma trace elements before compared with during enteral nutrition/dietetic counselling as well as differences in bone marrow recovery, hospital stay, and play performance between the two groups. Simple linear regression analysis was used to describe the relation between the duration of feeds and the improvements in the nutritional status. Fisher’s exact test was used for the comparisons of the incidence of vomiting, diarrhoea, and fever as well as positive blood cultures between the two groups. Poor nutrition was common, even before transplantation: 13 of the 29 patients had a z score for at least one anthropometric variable (weight for height, mid arm circumference, or height for age z score) less than −1. Wasting (weight for height or mid arm circumference, or both, z score <−1) affected two of the 29 patients, while poor linear growth (height for age z score <−1) affected 11 of the 29 patients. Vomiting, diarrhoea, and fever after BMT had a similar incidence in malnourished and non-malnourished patients occurring in six, four, and seven of the 13 malnourished patients respectively, and in two, four, and four of the 16 well nourished ones respectively (p=0.09; p=1; and p=0.1 respectively). Similarly, there was no difference in bone marrow recovery between the two groups. Hospital stay tended to be longer, however, in the malnourished patients without the difference reaching statistical significance: median (range) days of hospital stay were 33 (20–266) v 27.5 (14–43) respectively; p=0.09. Of the 21 patients who received enteral nutrition, two patients were discharged on home enteral nutrition and 11 reached sufficient oral intake during the daytime and stopped the overnight feeds after a mean duration of 22 days. Eight patients were treatment failures. Seven of them vomited the tube after a mean duration of 10 days of enteral nutrition, while one stopped feeding after eight days of enteral nutrition because of diarrhoea. Six of these eight children were switched to parenteral nutrition. The mean (SD) energy intake provided by overnight nasogastric feeding was 3.43 (0.89) MJ/day (820 (212) kcal/day), which provided a mean (SD) of 48 (6.5)% of the estimated average requirements for energy. Oral intake during the daytime was not measured. 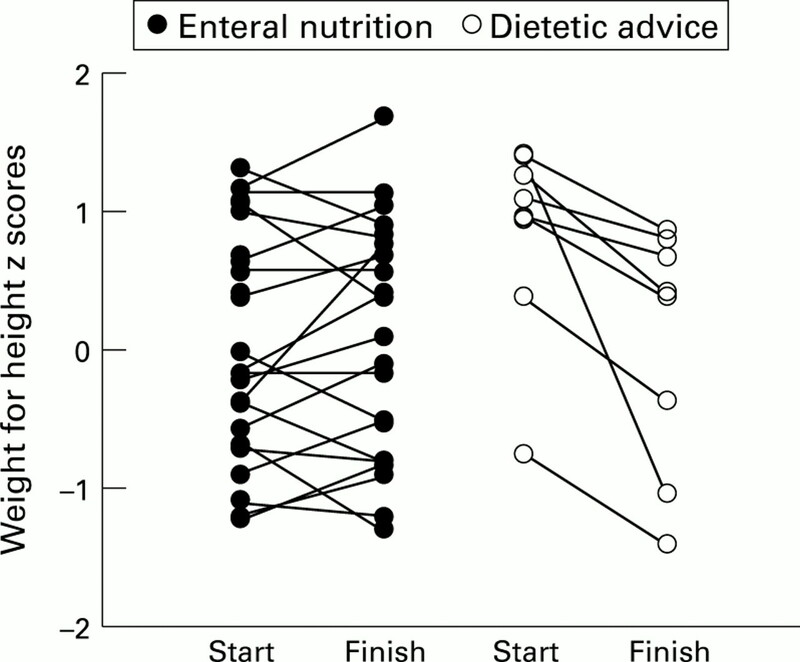 Nasogastric feeding maintained nutritional status after BMT, while dietetic advice alone was associated with a non-significant deterioration in the nutritional status (see fig 1): mean (SD) weight for height and mid arm circumference z scores at the start and finish of enteral nutrition were 0.01 (0.8) v 0.13 (0.8) respectively (p=0.4); and 0.05 (0.7) v 0.06 (0.8) respectively (p=0.3); weight for height and mid upper arm circumference z scores at the start and finish of dietetic advice were 0.8 (0.7)v 0.04 (0.9), (p=0.07); and 0.13 (0.7) v−0.35 (0.8) respectively (p=0.2). Furthermore, significantly less deterioration in the weight and mid upper arm circumference were shown in the group who received enteral nutrition compared with dietetic advice alone: mean (SD) weight for height Δ z scores (differences between z scores at the start from those at the end of enteral nutrition/dietetic counselling) were 0.08 (0.4) v −0.79 (0.7) respectively (p=0.0005); mid upper arm circumference Δ z scores were 0.09 (0.5) v −0.49 (0.6) respectively (p=0.01). The duration of feeds was the major factor determining the size of the nutritional response. 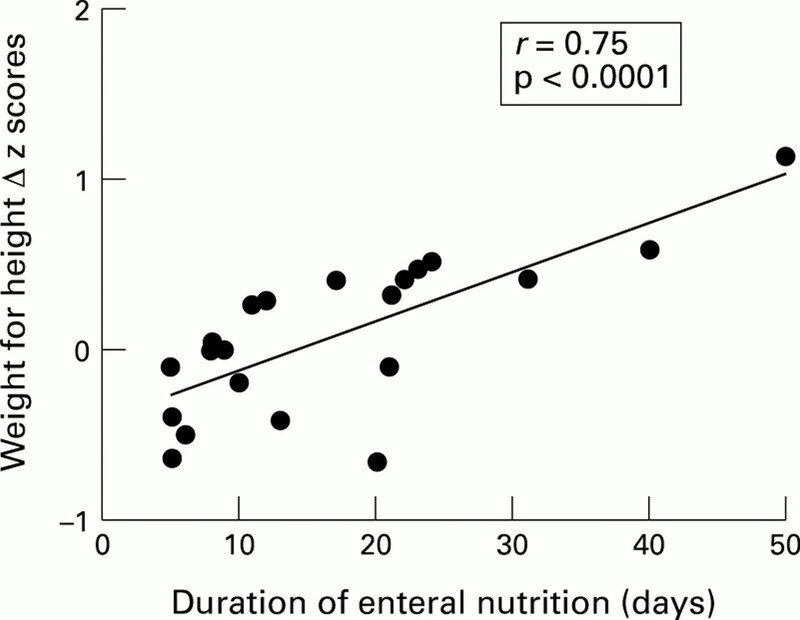 Significant positive correlations were found between the duration of enteral nutrition and the improvements in weight (r=0.75; p<0.0001; see fig 2) and mid upper arm circumference (r=0.74; p=0.0004; see fig3). Changes in weight for height z scores during enteral nutrition (n=21) or dietetic counselling (n-8). Enteral nutrition was associated with a non-significant improvement (p=0.4), while dietetic counselling with a non-significant deterioration (p=0.07) in the nutritional status. Correlation between the improvement in weight and the duration of feeds. The improvement in weight was correlated with the duration of feeds (r=0.75; p<0.0001). Correlation between the improvement in mid arm circumference and the duration of feeds. The improvement in mid arm circumference was correlated with the duration of feeds (r=0.74; p=0.0004). The incidence or the duration of vomiting and diarrhoea was not significantly different between the two groups, while fever and positive blood cultures were fewer in patients receiving enteral nutrition (see table 2). Furthermore, the provision of enteral nutrition did not influence clinical outcomes: hospital stay, bone marrow recovery, or the general wellbeing of patients after BMT were not different between the two groups (see table 2). A specific cause was identified in only two cases of diarrhoea, during enteral nutrition: rotavirus infection complicated later by graft versus host disease in one, and cutaneous graft versus host disease in another patient. In three of the four enteral nutrition patients with diarrhoea, stool was checked in order to exclude carbohydrate or fat malabsorption, or both. Positive reducing substances were found in only one case of diarrhoea (rotavirus infection), while faecal steatocrit was normal in all three patients. Serum albumin concentrations after BMT were comparable in patients who received enteral nutrition and those who did not: mean (SD) serum albumin (g/l) were 34.4 (2.4) v 36.2 (2.8), respectively; p=0.09. Furthermore, supplementary enteral nutrition did not prevent other deficiencies of some important micronutrients (see table3). This study showed that poor nutritional status was common even before BMT, and occurred in about half of the patients. We showed that supplementary enteral nutrition was not only feasible in children undergoing BMT, but was associated with fewer febrile episodes and positive blood cultures than standard dietetic counselling alone. Furthermore, it was more effective in preventing deterioration of nutritional status after BMT and significant positive correlations were shown between the duration of feeds and improvements in nutritional status. Nasogastric feeding was not associated with excess gastrointestinal disturbances or with overt nutrient malabsorption. However, enteral nutrition did not prevent biochemical deficiency of a number of nutrients. One limitation of this study was that it was not randomised. A randomised trial was considered to be unjustified in this group of patients, as previous studies by us and others in children with malignancies have shown that nutritional status deteriorates during chemotherapy if no nutritional support is provided.15 22 23 We therefore compared the response of patients receiving enteral nutrition, with patients who fulfilled the criteria for providing nutritional support, but who declined nasogastric feeding and instead followed the dietetic instructions for an oral intake of high energy. Another limitation was the absence of data on the oral intake of the patients. This was due mainly to large interindividual and intraindividual variation in dietary intake in these patients making any conclusions based on data on food intake likely to be misleading. Enteral nutrition is cheaper and safer than parenteral nutrition.35 36 In patients undergoing BMT, we are aware of two studies assessing enteral nutrition prospectively. A randomised trial in adults undergoing BMT showed fewer complications in patients receiving enteral nutrition compared with parenteral nutrition.13 Mulder et al reported a lower incidence of diarrhoea in patients receiving enteral nutrition than in those given parenteral nutrition alone.16 We know of no prospective studies assessing the tolerance and efficacy of enteral nutrition in children undergoing BMT. A recent anecdotal report, however, claimed that long term (duration of 300 days) enteral nutrition via a gastrostomy button was feasible in a child undergoing BMT.17 It was associated with an improvement in the nutritional status of the child and maintenance of normal visceral protein stores. There is uncertainty about the type of the feed which should be used after BMT. A variety of feeds have been used in studies in adults.37 38 Semihydrolysed diets have been shown to protect against the sequelae of abdominal radiotherapy in adults,39 while conversely, standard chow had advantages over elemental diet in rats receiving methotrexate.40Donaldson et al claimed successful management of radiation enteritis with a low residue, low fat and gluten, lactose, and cows’ milk protein free diet.24 It is not clear from that study, however, whether the improvement was due to the specific dietary manipulations or just to nutritional repletion. Halton et al reported a low frequency of transient malabsorption in children treated for acute lymphoblastic leukaemia.41 In our study, we showed that a diet containing lactose and cows’ milk protein was well tolerated by most of the patients without any signs of nutrient malabsorption. In conclusion, enteral nutrition, when tolerated, is effective in preventing deterioration of nutritional status of children undergoing BMT and has a number of other benefits, including less fever and positive blood cultures. Standard feeding regimens do not prevent trace element and mineral deficiencies. Nutritional biochemistry therefore should be closely monitored during nutritional support in order to provide supplements when required. The authors wish to thank the nursing staff of the BMT Unit for their contribution to the study; Ms Karen Rose, the play specialist of the BMT Unit for undertaking the weekly play performance assessments; and Alison French and Bridget Lambert the dietitians who supervised enteral nutrition. (1993) Abdominal complications in pediatric bone marrow transplant recipients. Radiographics 13:1101–1112. (1983) Graft-versus-host disease of the intestine: a protein losing enteropathy characterised by faecal α1-antitrypsin. Gastroenterology 85:1076–1081. (1996) Gastrointestinal and nutritional consequences of bone marrow transplantation. Arch Dis Child 75:208–213. (1987) Protein loss during acute graft versus host disease: diagnostic and clinical significance. Eur J Haematol 38:187–196. (1996) Diagnosis and clinical associations of zinc depletion following bone marrow transplantation. Arch Dis Child 74:328–331. (1981) A study of the nutritional status of paediatric cancer patients. Am J Dis Child 135:1107–1112. (1985) Nutrition and cancer: physiological interrelationships. Annu Rev Nutr 5:435–461. (1993) Effect of nutritional status on the incidence of infection in childhood cancer. Pediatr Hematol Oncol 10:283–287. (1981) Parenteral nutrition: is it ontologically logical? A response. J Clin Oncol 2:539–544. (1981) Total parenteral nutrition in bone marrow transplantation: a clinical evaluation. J Pediatr Gastroenterol Nutr 3:95–100. (1989) Prevention of yeast translocation across the gut by a single enteral feeding after burn injury. J Parenter Enteral Nutr 13:565–571. (1989) TEN versus TPN following major torso trauma: reduced septic morbidity. J Trauma 29:916–923. (1987) Nutritional support of bone marrow transplant recipients: a prospective, randomised trials comparing total parenteral nutrition to an enteral feeding program. Cancer Res 47:3309–3316. (1982) Supportive nutritional intervention in pediatric cancer. Cancer Res 42 (suppl) 766–773. (1992) An investigation of supplementary nasogastric feeding in malnourished children undergoing treatment for malignancy: results of a pilot study. Journal of Human Nutrition and Dietetics 5:85–91. (1989) Hyperalimentation in autologous bone marrow transplantation for solid tumors. Cancer 64:2045–2052. (1995) Enteral nutrition support in a child after bone marrow transplantation. Nutrition in Clinical Practice 10:140–143. (1981) New norms of upper limb fat and muscle areas for assessment of nutritional status. Am J Clin Nutr 34:2540–2545. (1992) Using the steatocrit to determine optimal fat content in modular feeds. Arch Dis Child 67:608–612. (1987) The measurement of performance in childhood cancer patients. Cancer 60:1651–1656. (1987) Dietary reference values for food energy and nutrients for the United Kingdom. (COMA, London) . (Report on Health and Social Subjects 41.). (1979) Reversal of protein-energy malnutrition in children during treatment of advanced neoplastic disease. Ann Surg 190:771–778. (1980) Effectiveness of enteral and parenteral nutrition in the nutritional management of children with Wilms’ tumor. Am J Clin Nutr 33:2622–2629. (1984) Nutritional support as an adjust to radiation therapy. J Parenter Enteral Nutr 8:302–310. (1983) Significance of hypoalbuminaemia in pediatric oncology patients. J Parenter Enteral Nutr 9:303–306. (1986) The pathophysiology of undernutrition in the child with cancer. Cancer 8:1874–1880. (1983) Problemes nutritionels crees par les traitements anticancereux chez l’ enfant. Rev Med Brux 4:333–337. Nico JJ, Ruymann FB, Nicol SJ. Nutritional support of pediatric oncology patients: identification of specific groups at increases risk.Proceedings of the 19th Annual Meeting of the International Society of Pediatric Oncology (SIOP), Jerusalem 1987..
(1984) The use of nutritional therapy. Am J Pediatr Hematol Oncol 6:261–265. (1989) Effectiveness of two methods of parenteral nutrition support in improving muscle mass of children with neuroblastoma or Wilms’ tumor. Cancer 64:116–125. (1989) Integration of nutrition support into oncologic treatment protocols for high and low nutritional risk children with Wilms’ tumor. Cancer 64:491–509. (1983) Effect of total parenteral nutrition on marrow recovery during induction therapy for acute nonlymphotic leukaemia in childhood. Med Pediatr Oncol 11:134–140. (1980) A clinical trial of hyperalimentation in children with metastatic malignancies. Med Pediatr Oncol 8:63–73. (1983) The effect of total parenteral nutrition on chemotherapy-induced myelosuppression. Am J Med 74:40–48. (1990) Nutritional support in hospitals in the United Kingdom: national survey 1988. Health Trends 22:9–13. (1990) Artificial nutritional support. Med Interna 82:3392–3396. (1981) Malnutrition and cancer. Clin Oncol 7:83–91. (1981) Continuous enteric alimentation with a blenderized formula in cancer cachexia. Clin Oncol 7:93–98. (1975) Dietary protection during radiation therapy. Strahletherapie 149:476–183. (1987) Alteration of methatrexate metabolism in rats by administration of an elemental diet. Cancer 59:31–37. (1993) Acute lymphoid leukemia. No evidence of consistent chemotherapy induced intestinal malabsorption. Am J Pediatr Hematol Oncol 15:271–276. (1995) Clinical and biochemical long-term toxicity after postoperative cisplatin-based chemotherapy in patients with low-stage testicular cancer. Oncology 52:300–305. (1995) A randomised study to determine whether routine intravenous magnesium supplements are necessary in patients receiving cisplatin chemotherapy with continuous infusion 5-fluorouracil. Eur J Cancer 31:174–178. (1985) Mineral balance during nutritional supplementation in adolescents with Crohn disease and growth failure. J Pediatr 107:473–479. (1996) Copper, selenium and zinc status and balances after major traumas. J Trauma 40:103–109. (1992) Serum trace element concentrations and iron metabolism in allogenic bone marrow transplant recipients. Ann Med 24:55–59. (1996) Trace element in long term parenteral nutrition. Nippon-Rinsho 54:172–178. The study was sponsored by the Children’s Hospital Bone Marrow Transplant Research Special Funds.